DESCRIPTION: Michael is a jazz singer, bandleader and actor. He's performed all over the world in various theatrical venues. From the Rainbow Room in NYC to the Showrooms of Atlantic City and Las Vegas. Large productions with a 7 - 17 piece orchestra or with a smaller band of 1 - 7 Musicians. 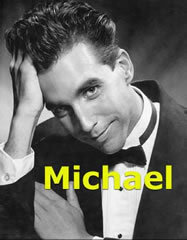 Michael-Andrew from Talent Screening Room on Vimeo.